Don’t throw those old canning lids away. 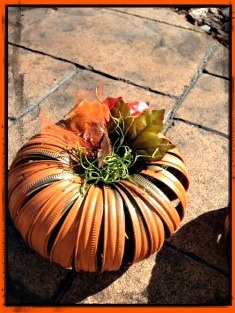 Make pumpkins instead! 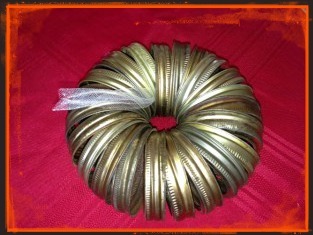 This is a super fun and easy way to recycle and make an awesome center piece at the same time. 1. 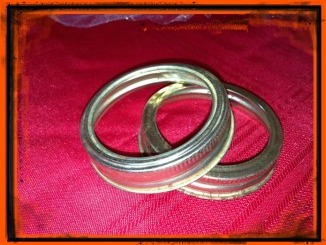 Run tulle through your rings, making sure they are all facing the same direction. 3. 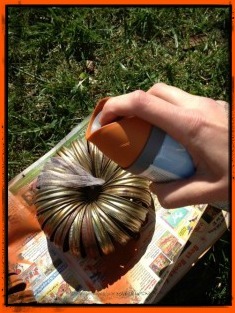 Spray paint the rings, remembering to separate them as much as possible to be sure all the rings are fully covered. 4. When that side is fully dry, flip over and paint again. 5. 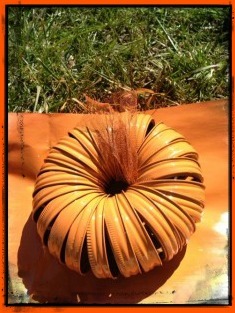 When your “pumpkin” is fully dry add the gold glitter. This helps to hide any imperfections you might have with the paint. Also it looks pretty cute. 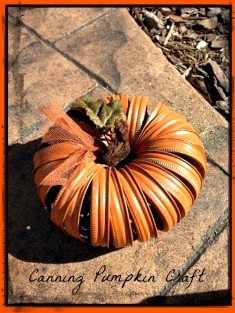 Glue the wood chip/ cinnamon to the middle near the tulle, and add your leaf. You can arrange your rings to achieve the look that fits you best. Neat idea but I would paint the rings before assembling them!